The Reports section is where you can view data about who you've sent emails to, who will receive your emails in the future, who has completed purchases, and who has unsubscribed from cart reminder emails. The Send Queue is a list of customers who have abandoned their cart and are scheduled to receive a cart reminder email. You can see the customer's email address, their cart total and cart ID, and when they are due to receive an email. Click on the magnifying glass icon to see what the email will look like. When a customer completes a purchase online, their email address will automatically be removed from the send queue so they will not receive any more cart reminder emails. Sometimes you may want to remove a customer's email address from the send queue manually. For example, if a customer abandons a cart and then calls your business to complete their order over the phone, you won't want to send them any more cart emails, but CartStack doesn't have any way to automatically know the purchase has been completed. To remove their email address from the send queue, click the Remove icon which is a circle with a diagonal line through it. Then click the red Remove From Send Queue button. Removing a customer from the send queue does not permanently unsubscribe a customer from CartStack emails. It only cancels the current email campaign they were scheduled to receive. To permanently unsubscribe a customer from ever receiving a cart reminder email again, view the Unsubscribes section below. The Send Archive lists every customer who has received a cart reminder email. You can see each customer's email address, their cart total and cart ID, and when they received the email. Click on the magnifying glass icon to see what the email looked like and get stats on how your customer engaged with it. The Recovered Carts page lists data for every customer who engaged with a cart reminder email and returned to your site to complete a purchase. We count a sale as recovered if a customer who abandoned their cart has engaged with our email in some way. That means they need to at least open the email, or even click through the email, and then complete their purchase. If a customer returns to your site to complete their purchase without opening a cart reminder email from us, we do not take credit for recovering that sale. The Unsubscribes page lists customers who have unsubscribed from cart reminder emails. If you'd like to unsubscribe a customer, click the blue Manual Unsubscribe button and enter their email address. Unsubscribing a customer will prevent them from ever receiving a cart reminder email again. If you would instead like to simply cancel the current email campaign a customer is scheduled to receive, use the instructions above to remove them from the Send Queue. 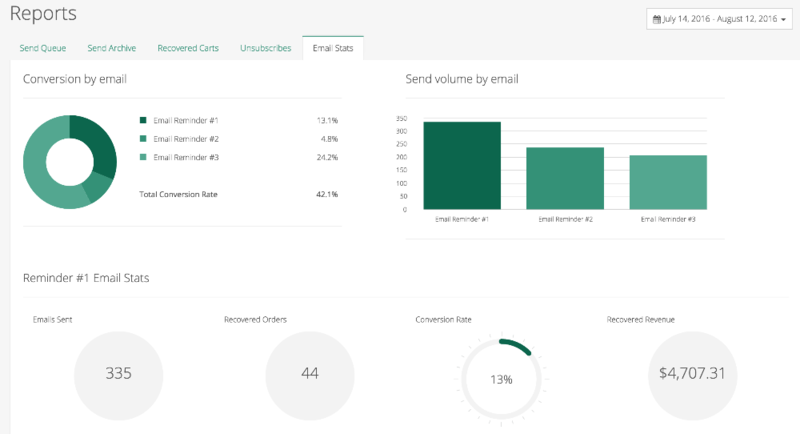 You can view a data breakdown for each of the emails in your campaign including how many of those emails were sent, how many were opened, how many resulted in conversions, and how much revenue they recovered. Visit the report page you'd like to export. Click the blue Export button in the top right corner.